In last week’s first installment of Hip Hip Hooray, we looked at the structure and function of the gluteus medius and minimus, and also what can happen when they are weak or dysfunctional. This week, we will learn how to do a couple of quick, observational tests to assess for hip abductor weakness. Observe the movement of the pelvis in the frontal plane. Repeat on the other leg. A positive test refers to dropping of the hip opposite to the stance leg, as in image B below. Common Compensation: If the hip abductors are weak, the client may compensate by taking the torso over the stance leg in order to decrease the demand on the hip abductors. 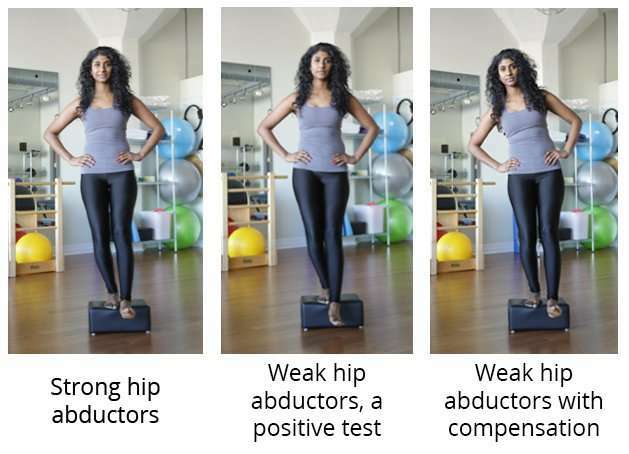 As seen in both of the above tests, weak hip abductors decrease the ability to keep the pelvis level in the frontal plane. This manifests in a Trendelenburg gait, in which the opposite hip drops down, as in the image above for the Trendelenburg test. When a client is walking on their right leg in the stance phase of the gait cycle and their left hip drops down, this indicates a weakness in the right hip abductors. If hip abductors are weak on both sides, it results in a waddling gait, which is reminiscent of the strut of a Vegas showgirl. As in the Trendelenburg test, the client may compensate for this hip abductor weakness by leaning the torso out over that weak hip, in an attempt to keep the centre of gravity over the stance leg. This gait deviation is known as a lateral trunk lean, or lateral list. These clients will have tightness in their lumbar spine and their quadratus lumborum as a result of this compensation. Another compensation is to increase the flexion of the trunk over the weight-bearing hip. This unconscious strategy employs the more powerful psoas muscles and anterior portion of the gluteus medius to make up for weakness in the posterior portion of the hip abductors. Lastly, the client may demonstrate an increase in hip internal rotation, or a “toe-in” gait, in which they may walk slightly pigeon-toed. 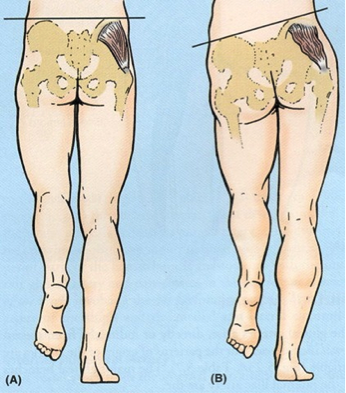 This gait dysfunction relates to the inability of the gluteus medius to resist hip internal rotation and adduction. Now that we have a better understanding of what to look for in our clients, stay tuned for Part Three of Hip Hip H00ray, in which I will show you effective Pilates and non-Pilates based exercises to strengthen the all-important hip abductors. Body Types 1: Who’s your body double?